The operative word is RATE, not the number of crimes itself. Lowest legal requirement for concealed carry has equaled nearly the lowest crime rate. Fact. Rwede wrote: The operative word is RATE, not the number of crimes itself. Lowest legal requirement for concealed carry has equaled nearly the lowest crime rate. Fact. Yet you cannot be sure that the two are directly related. Perhaps a search would reveal that Vermont has the highest rate of red sock ownership... Would that then mean that in order to have a low murder rate you need citizens to have red socks? Rwede, I think you deliberately missed the fact that Vermont has no major cities or metropolitan areas with largest town in the state being around 40,000. Where does most of the crime happens? Ethnically diverse metropolitan areas. Where does the crime almost never happens? In areas where US oldest and whitest people live. So, the lowest crime rates have nothing to do with gun ownership. PS: You know, while I despise childish "Let's ban anything that looks scary" posters, you and steelrules with your "Let's arm everybody" backwards *bleep* logic don't do the pro-gun side any favors, that's for sure. Sounds equally if not more childish. Is Nab holding classes in spin doctoring to refute FACTS that don't suit one's agenda? "I am definitely in favor of what we did," he said. "It may not be totally responsible for the decrease, [but] it is a part." "I didn't think it could be written in a constitutional fashion," he said. "Obviously, it was constitutional, because the American Civil Liberties Union challenged it in court and we won." Although the law is now being credited with a drop in crime, Jones said that was not the law's original purpose. He also pointed out that Kennesaw did not have a big problem with crime before. "The crime rate wasn't that high to start with. It was 11 burglaries per 1,000 residents in 1981," he said. According to the Kennesaw Police Department, the city's most recent crime statistics show 243 property crimes per 100,000 residents in 1998, or .243 per 1,000. The city's crime rate continues to be far below other metro Atlanta city's with similar populations, like Decatur. In 1998, Decatur recorded 4,049 property crimes per 100,000 residents. "It was done in response to a law passed by Morton Grove, Ill., outlawing gun ownership within the city limits," he said. "Several council members were upset Morton Grove had gotten a lot of attention with their ordinance so they decided to top them. "They figured the gun ownership ordinance would knock that city right off the front pages. They were right." "I have been to Australia and Europe and when I tell people I am from Kennesaw they recognize the name as the place that requires everyone to own a gun," he said. "We believed in the right of people to own guns," he said. Jones said he has sold 550 copies of a 1994 book about the first-of-its-kind law, "The Law Heard 'Round the World." "There are many outs," he said. "When you look at it, almost anyone could fit into one of the exempted groups." Among those exempt are residents "who conscientiously oppose maintaining firearms as a result of beliefs or religious doctrine." Others exempt include the physically and mentally disabled, paupers and those convicted of a felony. The law contains no clause addressing punishment for violating the law. If convicted, City Clerk Diane Coker said punishment would be determined by the general penalty clause of the Kennesaw Code Ordinance - probably a fine of about $100. "Our population has increased just like everyone's in Georgia in the past 20 years," he said. "The law really hasn't done any harm to the city's growth." The city's population in 1998 was recorded at 14,493 - a sharp increase over the 8,936 residents recorded in the 1990 census. "These laws don't have laws don't have an impact on a company's decision to move to Cobb County," Cooper said. "Many communities have strange laws that are out of date. Businesses look at many factors when relocating, such as quality of life, education, infrastructure and available workforce." "Kennesaw is home to more manufacturing businesses than any other Cobb city," he said. "Companies have said they want to be located in conservative areas." And Kennesaw isn't the only city in Cobb with an unusual law on the books. You know the anti-gun agenda by some on this forum just sickens me. Rwede wrote: Is Nab holding classes in spin doctoring to refute FACTS that don't suit one's agenda? You know full well that I can pull out the same kind of statistics that refute your agenda. My point is that this is not a black and white, guns/no guns issue. There seems to be more to it than that. "You can't argue with the fact that Kennesaw has the lowest crime rate of any city our size in the country,"
"The city's crime rate continues to be far below other metro Atlanta city's with similar populations, like Decatur. In 1998, Decatur recorded 4,049 property crimes per 100,000 residents." That's irrefutable evidence that gun ownership reduces the crime rate. It leads the country, and it leads neighbouring cities with similar demographics. 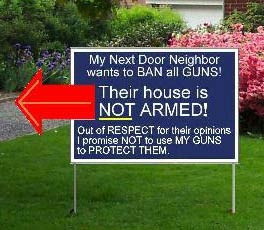 If you lived beside me, I'm afraid I'd be putting up this sign. Good luck. Rwede wrote: That's irrefutable evidence that gun ownership reduces the crime rate. I'm sure you think so. On the other hand, if gun ownership reduces the crime rate then why does the US have a murder-by-gun rate about six times that of Canada? How is it that Australia enacted tough gun ownership rules, reducing the number of guns in that country, and the murder-by-gun rate dropped substantially? Captain Awesome wrote: PS: You know, while I despise childish "Let's ban anything that looks scary" posters, you and steelrules with your "Let's arm everybody" backwards *bleep* logic don't do the pro-gun side any favors, that's for sure. Sounds equally if not more childish. I get the feeling, some are attempting to turn this into a "ban all guns" issue, when in fact most of the opinions posted don't seem to support that. Many, from what I can see, are on the same page I'm on, which is in favor of banning the ownership of, the type of weapon that belongs only in the military, and that's it. I haven't suggested "guns" be banned, simply assault style weapons, ones capable of firing large numbers of bullets in rapid succession, regardless of whether they are actual military guns, or some knock off, sold to the public under another name, that simply turns it into a semantics thing, and has no bearing on the overall issue. Simply put, private people do NOT need to own such weapons, whether they like them or not, just as my possible enthusiasm toward armed jet fighters, doesn't entitle me to keep one in my driveway, in case of invasion by some foreign power. So much for your theories. Makes sense to me. Disarm people and that's where the bad guys will go. Perhaps prohibiting gun manufacture and limiting sales is a better solution. Centralize gun sales so that its not as easy as a trip to Walmart. Doesn't the U.S. have more 'bad guys' per capita than Canada? Doesn't the U.S. have a higher level of gun ownership? Rwede wrote: So much for your theories. So much for your cherrypicking.